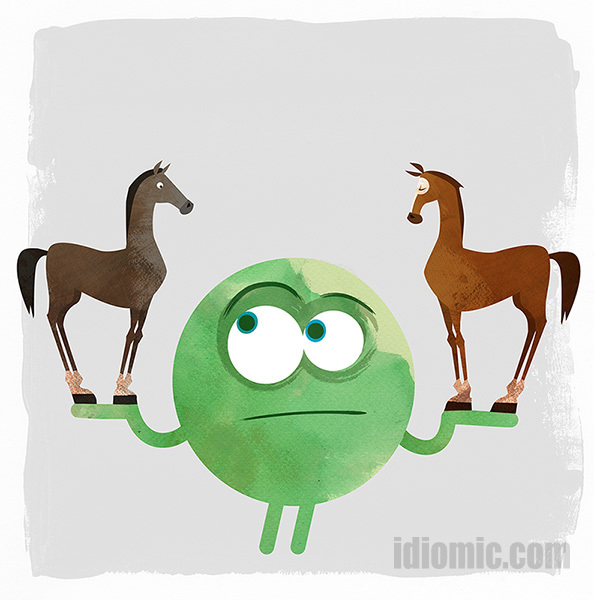 Example: “Hold your horses!” Jen shouted at her husband as he ran towards the pub. He’d heard there was free beer to be had. Not surprisingly, this command dates back to the American West and the time of cowboys, six-guns, and wagon trains. It simply refers to pulling back on your horses’ reins in order to bring them to a halt. First found in print in 1843, the original phrase was more informal, being ‘hold your hosses’. It wasn’t until the 1930s that the modern version first appears. Some sources cite its heritage all the way back to Homer’s Iliad, the story of the siege of Troy. In it, Menelaus tells Antilochus to hold his horses during a chariot race. This is more likely to be co-incidental in nature, and the choice of words by the translator, rather than the birth of an idiom.